Downtown St Petersburg is not exactly Manhattan, but then again I would not want it to be. 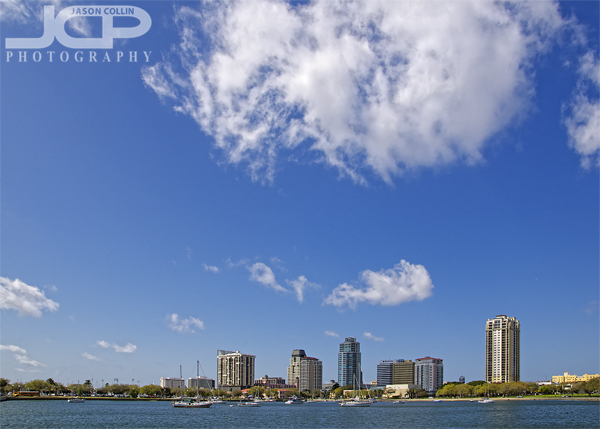 Finally the "Sunny Florida at f/11" project continues. When I was visualizing this photograph, I thought the large cloud above really dwarfed downtown St. Petersburg's minimal skyscrapers. It seemed almost like some large, natural mothership looking down upon lesser, artificial creations. So I composed the shot with the buildings very low in the frame to stress the largeness of the cloud even more. Also, a first: using Photoshop's "lens correct" filter. This made all the buildings stand up straight, not just the one in the dead center. To apply this filter in Photoshop CS4: FILTER --> DISTORT --> LENS CORRECTION Then use the Vertical Perspective slider toward the bottom until all the buildings stand up straight. Thanks to Ken for first explaining this tip. In my mind I want the next photograph in this series to be of palm trees along the beach, a more traditional Florida landscape. I will see what I can find. If you have any tips for a location like this in the St. Petersburg/Clearwater areas, please let me know in the comments below.